The University of Redlands Office of Career & Professional Development (OCPD) wants to enable students and alumni to be intentional in their decision-making regarding their career choices during and after their time at Redlands. This year, the office has gone through some changes—including a new executive director, new location, and several new programs—and the team is excited to share these with the U of R community. In August, Kelly Dries, formerly of the University of Utah, joined Redlands as executive director of the OCPD. Since then, she has been working with Courtney Carter, OCPD associate director, and Lauren Wooster, assistant director, to improve services and continue to build strong networks within and outside of campus. One of the biggest changes so far for students like me has been the shift from appointment-based scheduling to an open “Career Studio” workshop. 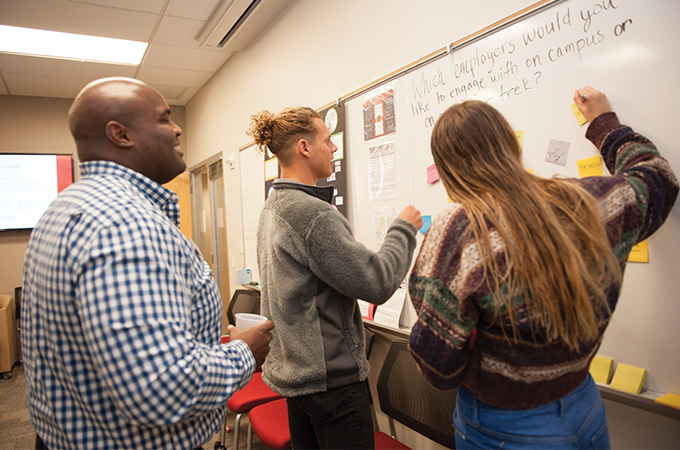 Regular workshop hours—from 11 a.m. to 7 p.m. on Tuesdays and 11 a.m. to 5 p.m. on Wednesdays and Thursdays—facilitate timely and collaborative feedback, enabling students and alumni to come in and start projects with mentors nearby, ready to help with any questions that arise. The group’s location also recently changed. Now based on the ground floor of the Armacost Library, in room 116, the team uses the new space to help facilitate workshops and to stay in close proximity to student life. The office recently held two open houses, one for students and another for faculty, staff, and alumni, to introduce the new and improved OCPD. I attended the first open house with nearly 50 other students. In addition to learning about existing programs, we were invited to speak up about what we wanted to see the OCPD offer. We shared our ideas about connections, speakers, and more by writing our thoughts on post-it notes and putting them up on a whiteboard. OCPD staff members encouraged us to stop by the office, regardless of how much (or little) planning we have done regarding our professional career path. They noted that often students have been focusing simply on getting into a university and now at the U of R they need help setting themselves up for the next big steps. Around 80 faculty, staff, alumni, and trustees attended the second reception. The attendees were also asked what they would like to see from the OCPD. One of the goals of the office is to enhance collaboration and engagement with career development efforts across campus, which many of the comments touched on. Colleagues mentioned they would like to see employer and alumni guest speakers and panels on campus as well as more outreach to campus departments regarding professional growth opportunities and training around career resources available on campus. This semester, the OCPD plans to relaunch a Career Advisory Board, which will continue the growth and impact of OCPD’s efforts to increase collaboration and create a career ecosystem across campus. According to the OCPD team, students and alumni alike should keep an eye out for OCPD’s many upcoming events and make the most of the University-wide career development tool, Handshake. Handshake has every upcoming OCPD event on its calendar, as well as providing access to more than 2,800+ job postings and 700+ internship postings from over 7,000 employers from all over the country. Handshake also offers resources, such as suggestions for creating résumés and cover letters, available 24/7. The Office of Career & Professional Development is open Monday through Friday from 9 a.m. to 5 p.m., and can be reached at 909-748-8030 or at ocpd@redlands.edu.